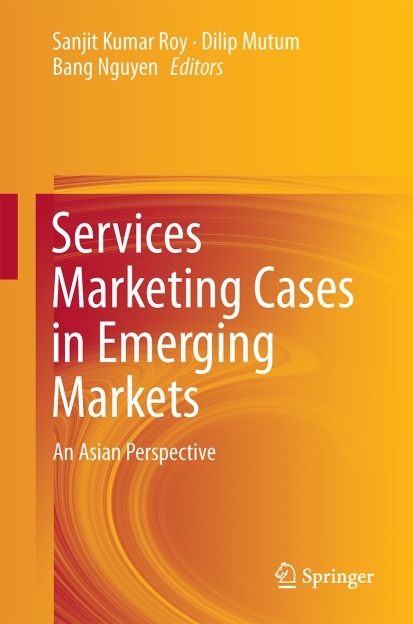 I am delighted to announce that our latest book 'Services Marketing Cases in Emerging Markets: An Asian Perspective' has now been published by Springer. I would like to thank all the contributors and my co-editors Sanjit Kumar Roy (The University of Western Australia) & Bang Nguyen (East China University of Science and Technology). You can buy the book on the Springer site for 57.19 € (Hardcover) and as an eBook for 44.02 €. It is also available on Amazon.com. This casebook provides students and academics in business management and marketing with a collection of case studies on services marketing and service operations in emerging economies. It explores current issues and practices in Asia, across different areas, countries, commercial and non-commercial sectors. This book is important and timely in providing a framework for instructors, researchers, and students to understand the service dynamics occurring in these countries. It serves as an invaluable resource for marketing and business management students requiring insights into the operationalization of services across different geographical areas in Asia. Students will find it interesting to compare and contrast different markets covering important aspects related to services.